I’ve been passionately involved in theatre since I first trod the boards aged about 9 or 10. Most of my experience has been in amateur theatre (not "amateur dramatics" – here’s why), principally the Talisman Theatre in Kenilworth and the Loft Theatre in Leamington Spa, for whom I’ve been acting, directing and composing music for 31 and 34 years respectively. At the Talisman, I’m also occasionally to be found pulling pints behind the bar, and was Editor of the members’ newsletter (the legendary Talismag ) from 1990 to 1997. At the Loft, I’m currently a member of the Artistic Management sub-committee as well as being the theatre’s webmaster and editing the programme and newsletter that accompanies each show. I’ve also "guested" at most other local amateur theatres at one time or another, done tours, festivals, promotional work, video, improvised comedy, voice art for a few computer games and audiobooks, even a bit of TV – check out my complete small screen filmography at the Internet Movie Database. Since 2004 I’ve been doing acting and voice work semi-professionally – i.e. it’s not my principal source of income, but I do get paid for it occasionally (see my professional web site for a list of some recent gigs). In 2008 I played one of my lifelong heroes – Alan Turing, the gay codebreaker and founder of computer science, in Hugh Whitemore’s Breaking the Code at the Loft. My university degree is in computer science, so acting this unique role drew together numerous strands of my own life, much as the play attempts to do with Turing’s. More information about Alan Turing is available on the website maintained by Andrew Hodges, author of the biography Alan Turing, the Enigma on which the play is based. I was especially thrilled to meet Andrew when he was kind enough to come and see the last night of the play’s run at the Loft. 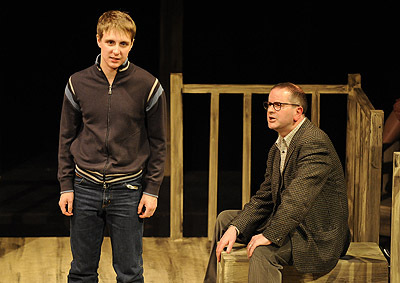 In May 2010 I made my main stage debut at Rugby Theatre, as the psychiatrist Martin Dysart in one of my favourite plays of all time – Peter Shaffer’s Equus . I played the boy, Alan, in a production of this play at the Loft in 1990, so having the chance to return to it after 20 years in the other lead role was a great opportunity. The production was extremely well received by audiences and an absolute joy to be in. I would go so far as to say that it has rekindled my enthusiasm for acting which had perhaps become a little jaded of late. Much of this is due to the director, John Smith, who shares my analytical approach to text and who pushed me to express extremes of emotion I might not otherwise have dared to explore; to the wonderful Aaron Blanche, whose performance as Alan Strang was fresh, raw and utterly fearless; and to the supporting company whose total commitment to the play was exemplary. Most recently, I returned to a role I played only three years ago (and a play I’ve done twice before): the harassed director Lloyd Dallas in Michael Frayn’s extraordinary farce about farce, Noises Off , at the Loft in July. My thespian CV – an anorak’s guide to all my performing, directing and/or composing credits for every production in which I’ve ever been involved. For some pictures of past productions, see the gallery section. I used occasionally to be asked to write music for theatre productions; some of it is collected on the music page. Why what I do is amateur theatre, not "amateur dramatics". The story of how my acting nightmare came true. In June 2001, I directed Jonathan Harvey’s play Beautiful Thing at the Loft. In view of the enormous interest in the play and its film adaptation, I’ve set up a page of production memorabilia. In September 1997, I directed Tim Firth’s Neville’s Island ("a comedy in thick fog") for the Talisman. The magazine Amateur Stage invited me to write an article on the experience for their regular feature The Play Produced ; here’s the article I submitted, illustrated with production photos as well as some of my own photographs of the real "Neville’s Island".